PDAs in AMWF relationships can be a tricky situation to handle. Hi there! It’s me, huggable Heather, with a topic that needs no real introduction because it’s already “out in the open”: Public displays of affection, or PDAs for short. You see PDAs everywhere – in the mall, at the movie theater, in the clubs… couples can’t wait to show their love and/or get it on, and they want everyone in their immediate vicinity to notice. Sometimes it’s just a light peck on the cheek or a hug that likes to linger longer. At other times, it’s a full-on make-out session, complete with soft moans and slurping kisses. You, playing the part of the innocent bystander, are now subjected to the very personal scene unfolding in front of you. Depending on the level of the PDA, it can range from unnoticeable or very awkward. But when it’s an AMWF relationship? Well, all eyes are on us when my Asian boyfriend and I walk around in public together. 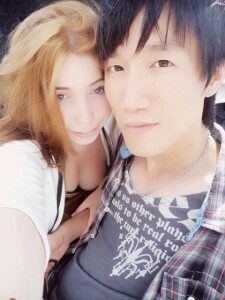 I doubt it has much to do with who we are as people – of course, it has more to do with the fact that AMWF relationships are more of an oddity than the norm. Unless we’re holding hands or being lovey-dovey with our PDAs in that way couples are, people usually assume we’re friends. …which brings me right back to PDA. I know many, if not the majority, of you will be disgusted, but I consider it a personal duty to engage in copious amounts of public displays of affection with my Asian boyfriend. There are places that are off-limits, like work or near small children, but everywhere else is pretty much fair game. Some people like to believe that AMWF relationships don't exist, but a healthy dose of PDAs can change that. Today, only 1 out of 4 Asian/White couples are AMWF relationships. We are a minority among couples, but that doesn’t mean we shouldn’t be visible. We are a working, living, breathing part of this country, just like any other couple. We deserve to be recognized. We have the privilege to be seen. I know no one is denying us of our rights or taking away our privileges, but even refusing to acknowledge our existence can be frustrating. PDA is, therefore, necessary for couples in AMWF relationships in order to solidify our existence in the minds of the nation and be seen as a normal, viable part of society. It pushes the boundaries of what defines a “typical” relationship and extends to include Asian men. By taking part in PDA with your Asian beau, you not only make AMWF relationships visible, but remind others that Asian men simply exist. From personal experience, this may be unusual for that special Asian man in your life. The majority of the guys I dated were uncomfortable with the idea of PDA. I get it, I really do. Traditional Confucian ideals and reserved Asian culture aren’t always conducive to makeouts on the subway, so it’s important to not overstep his boundaries with your PDAs. But while I never pushed them too far out of their individual comfort zones, I tried to get away with as much as I could. I would always hold their hand in public or hang onto their arm as we walked. Some were okay with kissing in public, others weren’t. Whatever their limits, I tried to portray to others that we were, in fact, an AMWF relationship – to validate the existence of the man I loved and make sure others saw him. It's important to not overstep his boundaries with PDAs, but you should still make sure that your Asian man is acknowledged. There are other subtle, non-physical PDAs that you can give your guy as well. One example is making sure other people, such as cashiers or servers, are addressing him. I know this sounds strange, but it comes from experience. When in public, I find other White people, for whatever reason, address me before acknowledging him, if they do at all. If you walk into a store together and the sales clerk, either purposefully or subconsciously, fails to greet him or speaks to you when answering his question, point that out. Usually, I just pause and let him do the talking when we are greeted, but if he inquires about something and the clerk speaks to me instead of him, I politely say that I was not the one to ask the question and that they should speak to my boyfriend instead. This does make them take a step back and it may even sound rude, but it reminds them that Asian men are approachable and deserve to be addressed. I call it a public display of affection because you are still displaying your affection – you are giving your Asian man, and by association, all Asian men, more visibility and a chance to be heard. If that isn’t affection, I don’t know what is. In my humble opinion – if you love your Asian man, you’ll hold his hand, give him a quick kiss, and maybe even make out with him in public. You’ll make sure others know of his existence. Show the world he’s worth loving. You’ll boost his confidence, self-esteem, and everyone else nearby will be wondering what he did to deserve an amazing woman like you!